Scrip is a fundraising program that our Home and School operates. It allows our school to raise money without having students go door-to-door to sell items. Using scrip is very easy. 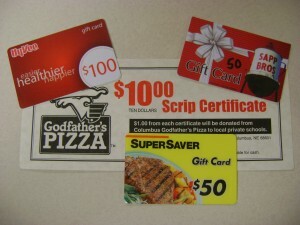 All you need to do is buy scrip (gift) certificates to use at your favorite places where you already shop and eat. We have access to hundreds of business from national big box retailers to national restaurants, local eateries and more. MANY other places (see scrip pre-order form for a complete list). We purchase the certificates at a reduced cost, sell them to you for face value, and the school earns the difference. For example, for every $100 Hy-Vee card we purchase, we pay $97 for each card. We sell them to you for face value, $100, and the school earns $3 per card. It’s that simple. Scrip can be purchased from the school office daily during the school year, and at St. Bonaventure Church from 9:30 a.m. – 12:00 p.m. on Sundays. Purchases can be made with cash or check. If you have any questions about this program, please contact the school office. PrestoPay lets you pay for your ShopWithScrip orders online – no more dropping off checks! PrestoPay securely links a bank account to your ShopWithScrip account so you can choose electronic debit when you checkout online. The rebate is automatically credited to your organization, and you don’t have to worry about cash or checks. PrestoPay makes ordering so convenient! For a small convenience fee of $0.15 per order, you can order and pay for scrip on your ShopWithScrip account any time day or night. When you place an order for physical cards, your Coordinator will include them in their organization order and distribute them to you when they arrive. Ask your Coordinator about your program’s ordering schedule to make sure you get your scrip when you need it. Once you set up PrestoPay, you can put your fundraising at your fingertips with MyScriptWallet, ShopWithScrip’s mobile website, which offers the widest selection of electronically delivered products and the highest rebates available anywhere. You can order electronic gift cards, reload physical cards, and in many cases redeem them right from your phone. And its fully integrated with ShopWithScrip.com so you only need one login and you can use your PrestoPay account in both places. MyScripWallet lets you shop on-the-go, earning rebates on every purchase. MyScripWallet is supported on Apple and Android mobile devices – just type www.MyScripWallet.com into the brower, login and you’ll be ready to shop. MyScripWallet also gives you access to any ScripNow eCard you’ve purchased, even when you’re on the go. The eCard will be delivered right to your ShopWithScrip account. You can print it out on your home printer and use it in stores just like a physical gift card, View the eCard on your phone with MyScripWallet, or you can use it for online shopping. Watch the video below to learn about ScripNow. Reloading an existing gift card is a time-saving option that allows you to add funds to gift cards you have already purchased through ShopWithScrip. Watch the video below to about ReloadNow. Here is a full list of retailers available with ShopWithScrip. Many retailers may not be immediately available in gift card form and will need to be ordered by the Coordinator, other retailers are available with a ScripNow purchase.